Well i guess it’s well beyond time I started posting about courgettes this year. We’ve had loads – not as many as we should have had given how many plants we have – lots rotting on the plant this year for the first time. So there is no glut yet and I’m not hopeful, but they are keeping us in our day to day needs for courgettes. We do however have a selection including for the first time stripy ones! 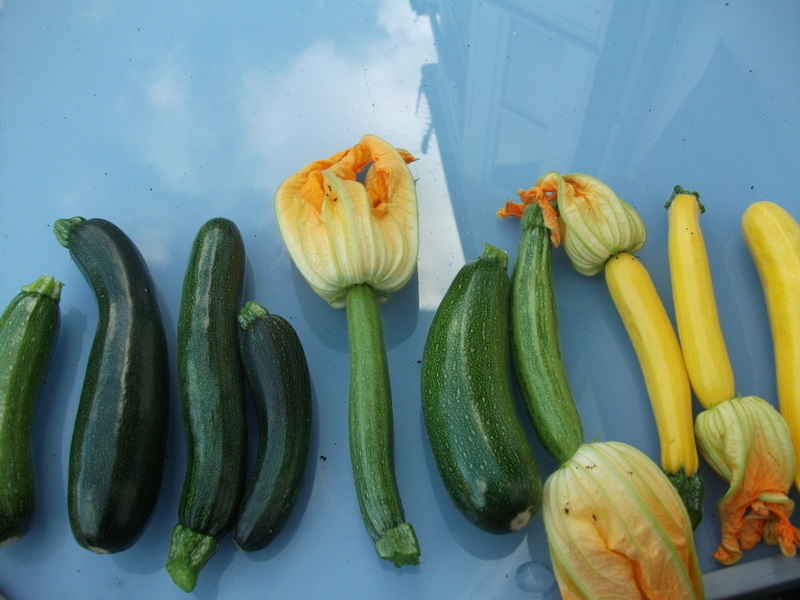 At home on the counter we have 9 courgettes and 3 diddy diddy baby courgettes. 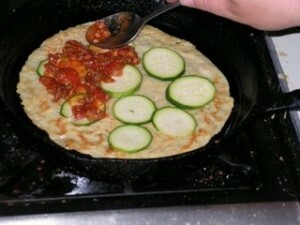 For lunch today I managed to use 2 courgettes. 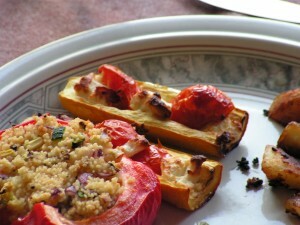 We had courgettes stuffed with feta and tomatoes with peppers stuffed with cream cheese and couscous and sautéed potatoes. Very very yummy. 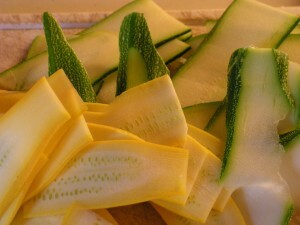 Other courgette meals have included a sosmix hash with courgettes in it with a side dish of courgette ribbons. And I have made the most yummy courgette loaf thing (think banana bread)which I added chopped walnuts and raisins to.We had the last slices today for elevenses while the girls are off at Do It4 Real camp and the boy was at holday club (run by the lovely people of Gunville Methodist Church). We’ve clearly opted for Grit’s option1, however Martin has not hoovered the stairs as he promised to do! 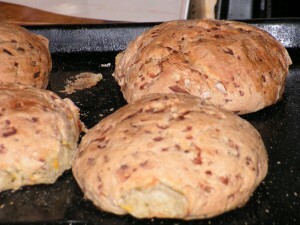 Courgette bread rolls, look nicer than they taste but a recipe that can definitely be worked on. 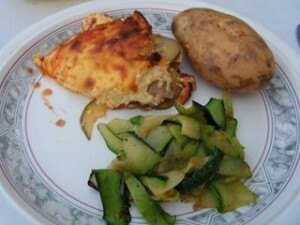 Here we have courgette mousaka with a side portion of garlic courgette ribbons! 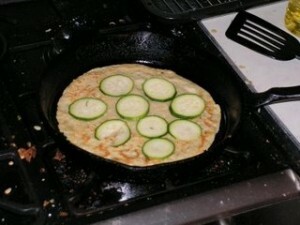 Here we have the courgettes being added to the top of a lovely pancake, incidentally being cooked in my wonderful cast iron frying pan. 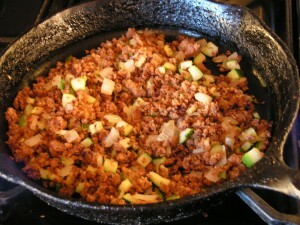 Here I add the bolognaise sauce. 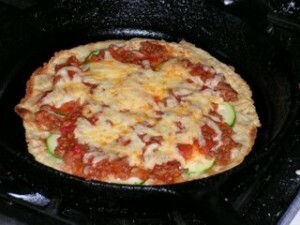 and here is the finished item with cheese melted over the top. And obviously, because my children are home educated, they won’t get one! Or maybe they will…….. just by following their interests, engaging in purposive conversation and leading their everyday lives. Hey Badman, leave those kids alone! So here we have Martin and Rebekah discussing the Home-ed situation in Germany in advance of her working with a research grp tomorrow (now today, was tomorrow yesterday iyswim). Bex is making notes and learning about politics and history. Jonathan is making a Lego model following a plan. Susan is making the dinner – and also taking photos while Ruth is out of the room doing brain training on the comp. Well clearly Rebekah isn’t doing anything educational – after all it wasn’t planned 12 months in advance. 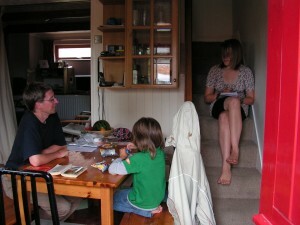 She also isn’t sitting around the kitchen table but rather on the stairs, this is clearly unsuitable for HE and should never be allowed. Jonathan picks up points for actually sitting in the appropriate place but once again the learning was not in the 12 month plan and can you really call playing with Lego education? Also this learning was all outside of school hours and so surely can’t be counted at all! Here is the whale Jonathan made out of Lego. Leading to discussion about the water coming up from the whale and Jonathan telling us that it isn’t water but air coming from a hole in a real whale. And so we start a discussion. Tut tut there we go again completely unplanned learning, it really shouldn’t be allowed! Yummy dinner! The courgettes in the distance are from our garden. But the educational value was not in the courgettes but the potatoes and why we don’t grow them, and crop rotation and potato blight. The questions were from Jonathan and the answers from Ruth. She knows these things because of reading an “Our Story” book about the potato famine. But guess what, we didn’t plan either her reading of the book or the chance discussion about it. So I guess that doesn’t count as education either.